Updated Tuesday March 3, 2015 by Jennie Menke. 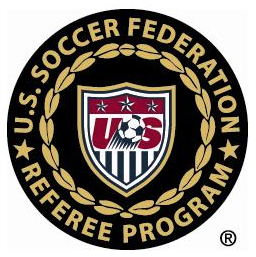 It's time to start referee certification for the upcoming summer soccer season. Quickstart: Head over to https://www.minnesotasrc.com/ to get started. Recreation Soccer is offered for children 5- 8 years old. The season begins at the end of May and concludes the third week of July. All practices and games are played at the Watertown Elementary school fields on Tuesday and Thursday nights. The 5-6 year olds play from 5:45-6:45 and the 7-8 year olds from 7:00-8:00 pm. All participants will receive an authentic soccer jersey as part of their registration. All players are required to wear shin guards and are encourage, but not required to wear cleats. A soccer ball is helpful, but not necessary. Most nights will have a 30 minute practice, followed by a 30 minute game. We rely on parent volunteers and can only form teams with the help of parents. All volunteers receive an account credit for helping out. Head coaches receive a full registration credit and assistants receive a 50% credit. All practice plans are prepared in advance for you and games are easy and manageable as we promote equal play! This is an competitive outdoor soccer program that is for players from ages 7-18 years old. It is a competitive league which includes travel to outside cities for games. The season begins in mid to late March and concludes by the 2nd - 4th week of July, depending on age level. A player can expect to have either practices or games 2-3 times each week. Games will begin in early May and continue into mid-late July. All practices are held at local gyms and/or fields in Watertown or Mayer. Each player is required to purchase a jersey uniform set once registered and assigned to a team. All players must have shin pads and gym shoes/cleats for all practices and games. In a typical season, each team will play 10-12 games. Half of all games at home and half at an outside city. All home games are played in Watertown and Mayer. Players are expected to attend as many practices and games. Please note: If your player is playing on a C2 or higher level team, they will be expected to participate in at least 75% of all practices. Parents are expected to attend team meetings and fill in any necessary forms. While it is not required, most teams choose to participate in at least one outside tournament throughout the summer session. Expect to pay additional fees to cover tournament costs. If we do not have a parent volunteer coach, it is possible that we will not be able to form a team or would need to hire a paid coach, if one can be found. If a paid coach is required, an additional coach fee will be required from each player. We would cap the additional cost to $100.00 per player. External links are provided for reference purposes. Crow River Soccer Club is not responsible for the content of external Internet sites. Copyright Crow River Soccer Club All rights Reserved.